Diversify your Direct Marketing Portfolio with custom printed door hangers. When considering your direct marketing needs, it is imperative to shout your message in multiple ways. Appealing to your target audience through various mediums of print advertising ensures that your business gets more than one bite of the elusive apple. Simple, yet effective your print advertising campaign is affordable and direct to customer with considerable ROI. Inktank assists your company with a large variety of targeted print collateral, spanning over a large range of clever and effective promotional items. 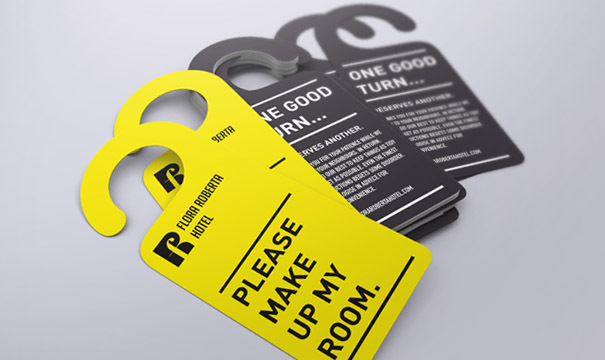 Door hangers are a strong addition to your print distribution campaign, and a versatile way to connect customers to your business. The legacy of door hangers is their use in hotels. This simple method of communication sends a clear message to hotel staff. What if this novel technique can be applied to all types of business? Interaction with your customers doesn’t need to be expensive or time consuming. Add a perforated business card to the bottom, or a sticky removable URL to your website and you have a strong marketing tool at your fingertips with minimal effort or expense. Rethinking ways to communicate with your audience is all it takes to get you talked about. Door tags insist on grabbing attention, in the two moments it takes to remove from the door handle, your brand is subliminally imprinted.